The Town of Rome Fire department is headquartered on the south end of the Rome Municipal Complex at the intersection of State Highway 13 and Alpine Drive. 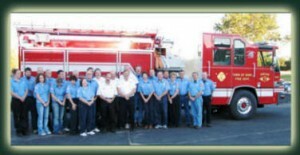 It is the mission of the Town of Rome Fire Department to create a better and safer community by providing a professional level of community fire protection, emergency medical and rescue services within the Town of Rome, in order to prevent the loss of life and property damage as a result any type of emergency. We accomplish this through comprehensive training, community education, and the acquisition and use of state of the art equipment. We do this because we enjoy helping others and take pride in creating a sense of security for our community and its guests. Firefighting comes with inherent risk and danger. We embrace this risk with a fearless attitude that does not underestimate the need for safety. We are committed to our mission. We stand always at the ready and we fulfill our obligations absolutely. We believe that every action reflects on all the members of our unit, both past and present. We are committed and accountable to each other because our lives depend on it. We are willing to give freely and unselfishly, even our lives, in defense of our community from any form of emergency. We value the public’s trust and are committed to honest and ethical behavior. We hold ourselves accountable to this value. We believe in a personal commitment to the organization and community. We have high standards for our work and interpersonal interactions both at the firehouse and with the public. Be Nice. Rome Fire Department was established in 1974 to provide services designed to minimize loss of life and property. This department services to a population of 2,900 residents in an area of 54 square miles. We have two stations one located at Alpine Ave. and Highway 13, the second near 15th Ave and Apache Ave. The community classification for the Rome Fire Protection Service Area determined by ISO is Class 05/10.